St Stephen’s Church has stood to the glory of God for 900 years. The first documented mention of St Stephen’s Church is a 12th century royal charter. At some point in the early 12th century, royal endowments were bestowed upon the Benedictine Priory in Norwich Cathedral in return for the monks providing and supporting a priest to serve the parish of St Stephen’s. In the early 15th century, Richard Caister was appointed priest at St Stephen’s. Caister was known as the ‘Good Vyker’ for his holiness of life, his concern for his parishioners and for the fact that he preached and wrote in English. Caister wrote a significant prayer which focussed on the grace of God through Jesus Christ. Caister was confessor to Margery Kempe and defended her in a hearing before Bishop Dispenser. After his death, Caister was buried in the Chancel of St Stephen’s and, due in no small part to the attention given to him in The Book of Margery Kempe, his tomb became a pilgrimage destination of national importance. Since his death, Caister has been associated with the Lollards, on hich opinion remains divided. 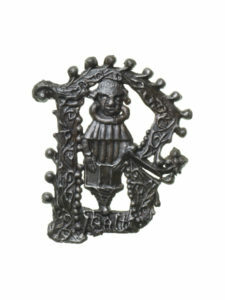 A Pilgrimage medallion depicting Caister preaching, c.1450. In the early 16th century, major rebuilding works were needed. The chancel was re-built around 1522 and the nave was re-built in 1547. The changed political context of the 16th century is reflected in the different character of these parts of the Church with the corbels of the chancel roof being more elaborate than those of the nave. Much of the original stained glass of St Stephen’s Church was destroyed during the English Civil War when a nearby powder magazine exploded. The royalist mayor of Norwich was taken into custody and the powder magazine was ignited in the ensuing riot. The explosion destroyed the Committee House and shattered the windows of churches for several miles around. In 1686 Thomas Grantham, a Baptist Minister, came to serve in Norwich. Grantham experienced hostility for his non-conformity but built a cordial relationship with John Connould, then vicar of St Stephen’s. After his death, Grantham’s corpse was under threat of abuse. Connould intervened and interred the body of Grantham in the middle aisle of St Stephen’s. Eleven years later, Connould died and was laid to rest beside his Baptist friend. Robert Govett, curate of St Stephen’s in 1841, became convinced of the Scriptural basis for adult baptism and wrote to the Bishop of Norwich explaining that he ‘cannot conscientiously use the service of baptism as prescribed by the prayer book anymore’. Govett’s license as a curate was swiftly revoked and he started a thriving independent chapel which was later to become Surrey Chapel. St Stephen’s underwent a further restoration programme in 1858. The west gallery was removed, the west door was opened, stained glass was inserted to the windows and the reredos was erected. These works characterised the appearance of the building until 2012. Records indicate that through the years of the First and Second World Wars, St Stephen’s remained very active with its services, clubs and Sunday School remaining busy. On the 19th September 1942 a 250kg bomb fell within St Stephen’s church yard and failed to explode. Had the bomb detonated, the building would have been destroyed. To mark this event and to thank God, St Stephen’s Church moved its Patron Saint’s day to the 19th September. The 21st century has seen dramatic changes. Developments within the city saw a major public pathway come through St Stephen’s Churchyard, which has made the Church building far more accessible. In 2009, on the day of the installation of the current vicar, Madeline Light, the building cracked along the eastern wall, resulting in major repair works. The Church adopted a mission statement for the period ahead: “Open Doors, Open Hands, Open Heart” . With the repair works and subsequent improvements to the café facilities, the doors of this Church are open to all in the city; with the resources from this community, our hands are open in generosity to those around us and with confidence and trust in each other, this community is open to one another from the heart. The St Stephen’s Church building is Grade Listed 1 and over its long history has had a number of restoration projects. The Tower is the church’s dominating & distinguishing feature. The lower half is predominantly knapped flint. The chequered effect is created by white stone. The flint & stone also combine to create the band of white shields above the entrance – this “flushwork” is a feature of many East Anglian churches. 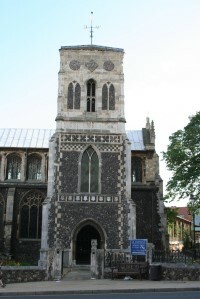 Rather than being at the west end of the church, the tower forms an upward extension of the north porch forming the main entrance. The martyrdom of St. Stephenis depicted in one of the roof bosses. With the tower over the north porch, and no rood screen, the eye can take in the full sweep of the inside from the west door to the altar at the east end in an uninterrupted view. Before the C16th Reformation, the interior of the church would have presented a somewhat different appearance from today’s. A rood screen placed across the church, just to the east of the north transept, effectively divided the church in two. There is evidence that there were five separate chapels each with its own altar. The most important was the Lady Chapel, now occupied by the organ, which was maintained for the Brasyer family, who owned a nearby brass and bell foundry, and were probably the wealthiest of St. Stephen’s parishioners. At the time that the new charter was given to Norwich by Henry IV (1405) no less than 5 sheriffs and 3 of the first 5 mayors were parishioners. As well as a memorial tablet, there are Brasyer family brasses in the sanctuary floor and west end. The holy water stoup in the Meeting Room is evidence of another altar. The N. transept housed another altar – seen through a “leper’s squint” (now bricked up). The initials “TC” in the timber roof just outside the transept is thought to stand for Thomas of Canterbury whose altar would have stood below – against the rood screen. Some wealthy parishioners such as Walter Daniel, provided in their wills for elaborate vestments and rich altar furnishings adding to the colour of church services at the time. The hammer beam roof is a fine example of its kind, with traceried spandrels (carved supports). This type of roof was particularly highly developed in East Anglia, and St. Stephen’s has a splendid specimen. The sixteen clerestory windows on each side, flood the church with light, gaining the nickname of the “Tudor Lantern.” Those in the chancel installed before the Reformation, have stained glass; while those in the nave completed after the Reformation, are plain glass slightly tinted. It will be seen that there are differences between the walls of the celestory above the chancel at the east end and those above the nave (main body of the building). The twelve corbels supporting the chancel roof representing angels with scrolls are more elaborate than those in the nave. The Chancel was completed about 30 years before the nave (at the behest of Dr. Cappe the vicar who is depicted on a commemorative brass on the north side of the sanctuary floor) around 1530 – thus the church has the rare distinction of being both pre – and post – Reformation. The Font is C16th. Formally situated in the North Transept it is now (since the 2009-12 restoration work) situated at the West end of the nave. There is a variety of stained glass, many panels with their own particular ‘history’. The Nativity window (below) is an example of those put in during thelast century. During the Second World War all the windows were blown out, with the exception of the East window,which was removed prior to the blitz, & the C19thSt. Stephen windowby C.E. Kemp in the south aisle. There are said to be some 600 burials beneath the floor, and the numerous mural tablets, as well as the floor slabs, many adorned with heraldic devices, are a reminder of the central position the church once occupied for its parishioners – sheriffs, aldermen, apothecaries, attorneys, stone masons, the military, and businessmen like the Bignold family, who founded Norwich Union Insurance. Some were immigrants, like Abram Bredal “of Spitalfields”, (by the north door), but probably originally from France. He may have been one of the many “Strangers” From northern Europe who, fleeing religious persecution came to Norwich. Of note are the the kneeling figures of John Mingay & his wife (1615 and 1642 – see below) at the east end of the north aisle, and above the north door the C18th Mackerell memorial by Norwich craftsman, John Ivory. There are 36 wall monuments. 2 Silver Flagons of 1627 given by Anthony Mingay part of a notable local family (see about John Mingay memorial above) mentioned frequently as rate payers in the St. Stephen’s account books for the 17th century. And a Gilt Chalice and Cover first listed in the Church Warden’s inventory in 1660. In re-ordering of the 1850’s three pairs of stall, with carved arms and misericord seats survived, a new pulpit was provided and sufficient pews to accomodate the large congregations of the period. St. Stephen’s is close to a busy city centre route. The churchyard on the south borders the new Chapelfield development. A pathway through the churchyard gives a scenic walk from the road to the shopping complex. The horse chestnut trees, grass areas, wild garden, many upright worn tombstones, and low walls gives a pleasant place to walk in or to sit and think. The above text describes the church as a building large enough in which local Christians can worship God, enjoy fellowship and meet the needs of others. But the word “Church,” as used about Christians throughout the ages, has another meaning. The Church is the body of those believers who acknowledge that God is the Trinity, – Father, Son & Holy Spirit, – and that Jesus, the Son of God, became a man to be the Saviour of all. Jesus saved, by accomplishing on the cross a way for all to be forgiven. He died and was raised to new life by God, and then ascended to His Father in Heaven. Now, the Holy Spirit guides us to do the righteous deeds God puts into our hearts. In gratitude to God, and at His command, Christians tell others the good news.